The rain storms that hit several parts of Nairobi and its environs yesterday left a trail of destruction on the power supply infrastructure and customers without electricity. The Government has released Shs.381.2 million to Kenya Power to rehabilitate Nairobi’s street lights and help promote a 24 hour economy in the city, Kenya Power Managing Director and CEO, Dr. Ben Chumo has said. Parts of Nairobi were without electricity this weekend as Kenya Power intensified its Boresha Umeme programme to rehabilitate power equipment and network in the city. The government has kicked off a Shs.10 billion initiative to promote a 24 hour economy by rehabilitating street lights in Nairobi City County. Kenya Power will implement a Government plan to procure and distribute 24,500 solar lanterns that will benefit 13 counties in arid and semi-arid areas, the Company’s Deputy Manager for Off-Grid Power Stations, Eng. Henry Gichungi has revealed. Two men were today arraigned in Nairobi’s Milimani Court for allegedly obtaining a total of Shs.230,000 from Kenya Power customers by false pretense. Kenya Power has launched a data gathering web portal that will help forecast the country’s electricity demand, enable timely power connections for prospective investors and enhance service delivery to large power consumers. Kenya Power has negotiated with various financial institutions to provide credit to Kenyans to enable them connect electricity to their homes and businesses, the firm’s Managing Director and CEO Dr Ben Chumo has said. 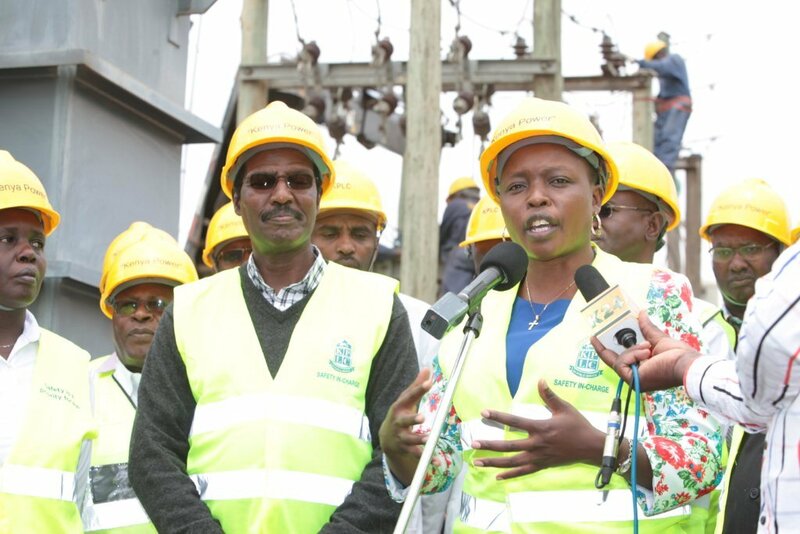 Narok County Deputy Governor, Mrs Everline Aruasa, speaks at a Kenya Power substation in the Narok town yesterday when Kenya Power staff conducted an exercise to upgrade the power network, as the Company’s Managing Director, Dr Ben Chumo, listens. Kenya Power installed new conductors on lines and built additional lines at a cost of Shs.60 million to improve reliability to the county renown for its tourism attractions. Kenya Power will connect 6,000 Narok residents with electricity as part of the Company’s ambitious plan to connect one million additional customers this financial year, the Company’s Managing Director & CEO, Dr. Ben Chumo has said. The African Development Bank (AfDB) has committed a USD150 million loan (approximately Shs.13 billion) to the government to finance part of the one million new electricity connections target announced by Kenya Power for this financial year. Kenya Power plans to connect one million additional customers to the national grid this financial year representing 36% growth in its customer base, the Company’s Managing Director & CEO. Dr. Ben Chumo has revealed.